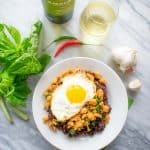 Move over the blueberries, this Thai black rice has got more anthocyanins than you. Black rice has more fiber, protein, iron, and antioxidants than any other type of rice, quinoa, or other whole grain. Despite the health benefits, people are not eating as much they should be. Now is the time to start. The terms are used interchangeably. 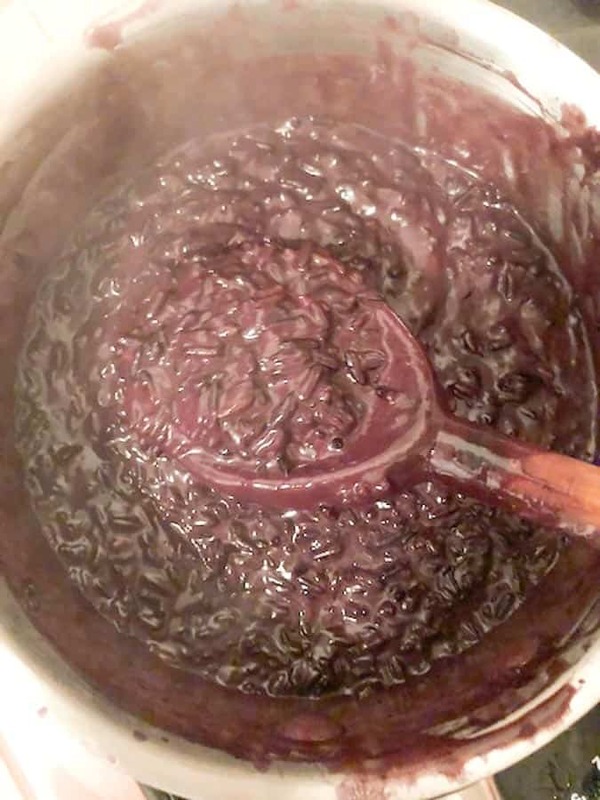 Thai black sticky rice is deep purple, variegated in color, and long grained with pointed ends. The Chinese version is a black, shorter grained, and round. 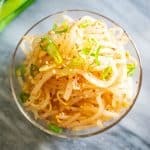 The Thai glutinous version is used in this recipe. Wild rice is black, but it does not have the glutinous properties the Asian varieties do. It would not work well in this recipe. 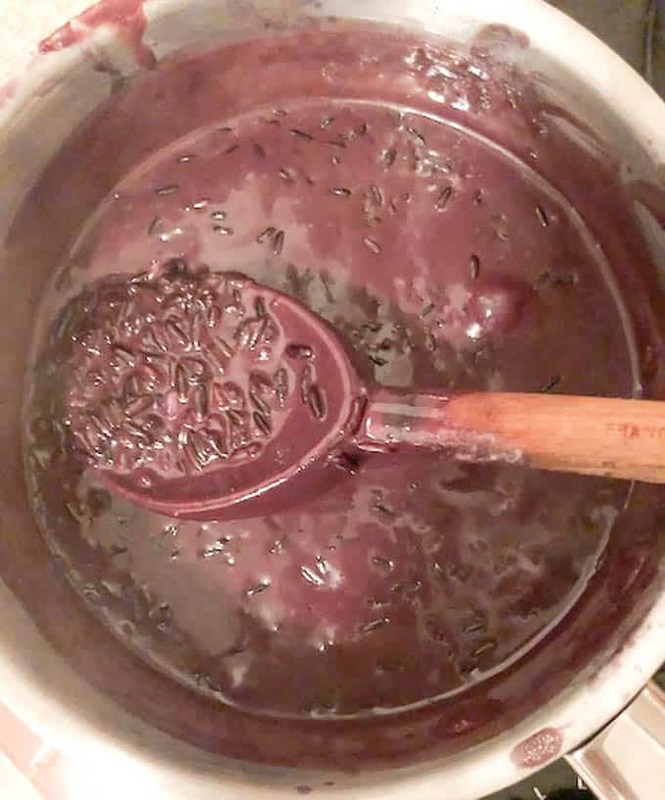 There have been some concerns about arsenic levels in black rice. Arsenic in general, is found in all types of rice depending on where it is grown, but is higher in brown and black varieties. Read more on whether you should be concerned with arsenic in rice. The method for cooking here is on the stove top, which does require some elbow action. 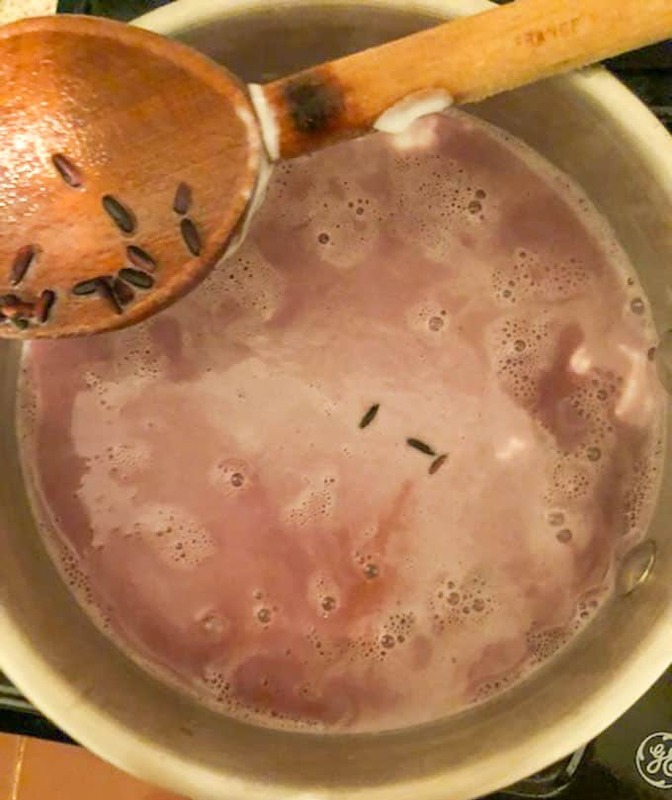 You could cook it in a rice cooker or slow cooker, but after a long day, when your brain cells have been depleted of all thinking capabilities, this simple rice pudding is just the right relaxation remedy. Especially if you do it while drinking. There is some pre-work involved, and this one should occur at 1-2 days before. Otherwise, you’ll be standing at the stove to cook those grains a whole lot longer than necessary. At this point, it does not matter what kind of wine it is. Just something that will keep you company for the next 30 minutes. You can do that right? Add 1 can coconut milk, rice, water, brown sugar, and salt. Bring to a boil. At this point, your sole focus is sipping wine. It will take a good 5-8 minutes to come to a boil over medium high heat. By this time, the wine should be working its magic. You may start to feel slightly inebriated from the wine, and you should start feeling a hair short of awesome. Now you need to stir. Stir the pot, so the rice does not burn. Keep stirring the pot, otherwise it will burn. Is this too tiresome? Constant stirring means that you’re working out your energy for the day. Instead of going to the gym, stir this pot. After about 30-40 total minutes, taste the rice. It should be fully cooked but slightly al dente. Remove from the heat. 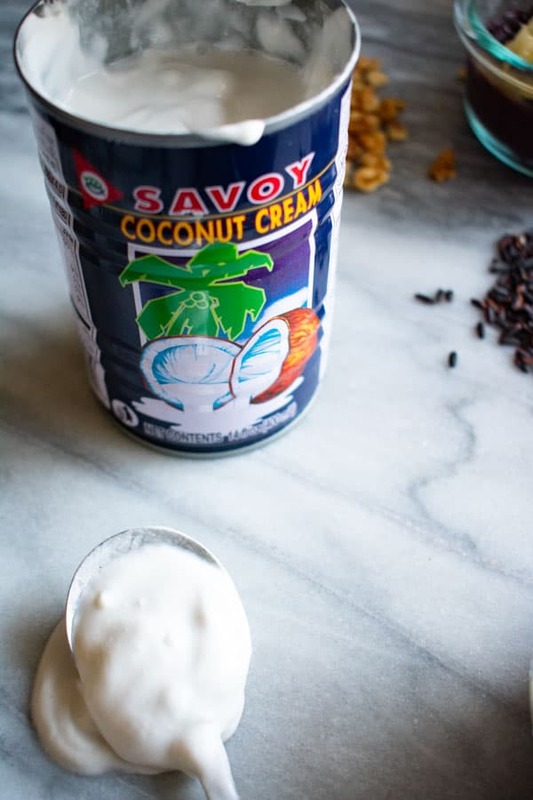 Slice fruit and open a can of coconut cream. Not milk. Coconut cream. Its shape is almost like soft whipped coconut cream. 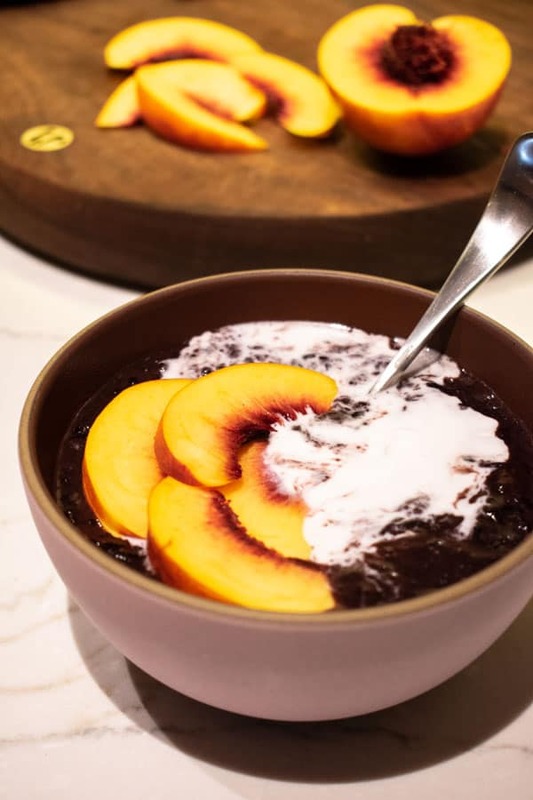 Spoon some hot rice pudding into a bowl and top with fruit and a spoonful of coconut cream. If you prefer the set it and forget it method, you can also put all the ingredients into a rice cooker, and cook as you would regular rice. 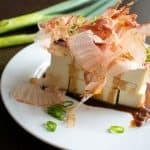 However, it may just be cooked a little more, rather than having the toothsome bite you can control by stirring it on the stovetop. Was that too much rice to eat in one day? 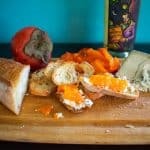 Pour the leftovers into jars or ramekins, and serve the next day cold. 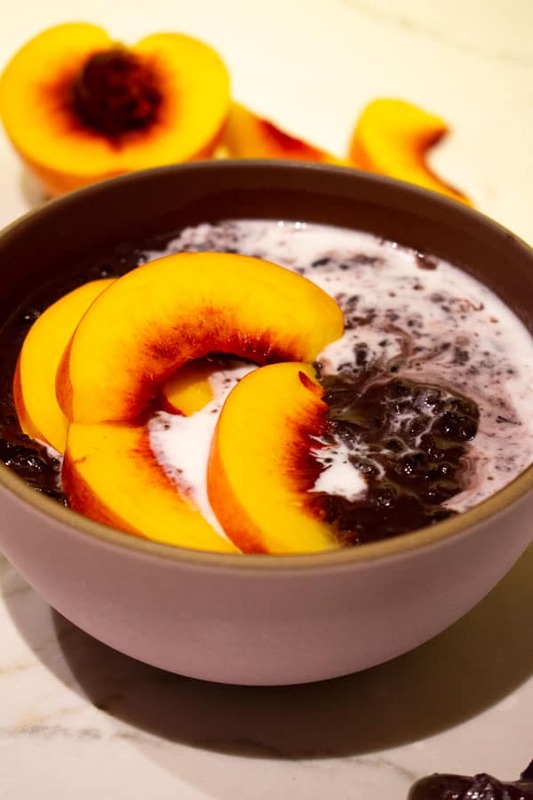 In Asia, black rice porridge/pudding is often eaten with chunks of yams. 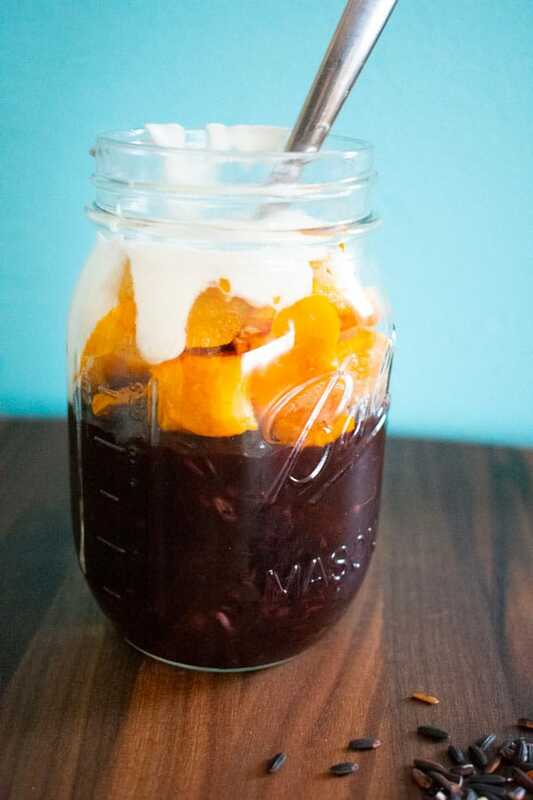 Instead of fruit, you could put roasted cubes of yams on top of the black rice before topping with coconut cream. This red wine from the country of Georgia is sweet. It is not a dessert wine, per se, just a red wine that has some sweetness to it. As such, it pairs very well with the slightly sweet rice pudding. Rich dark blackberry and boysenberry flavors along with the weight of the wine work with the color and texture of the black rice. Soft, rich and velevty, this wine is also pleasant to drink on its own, if you like some sugar. 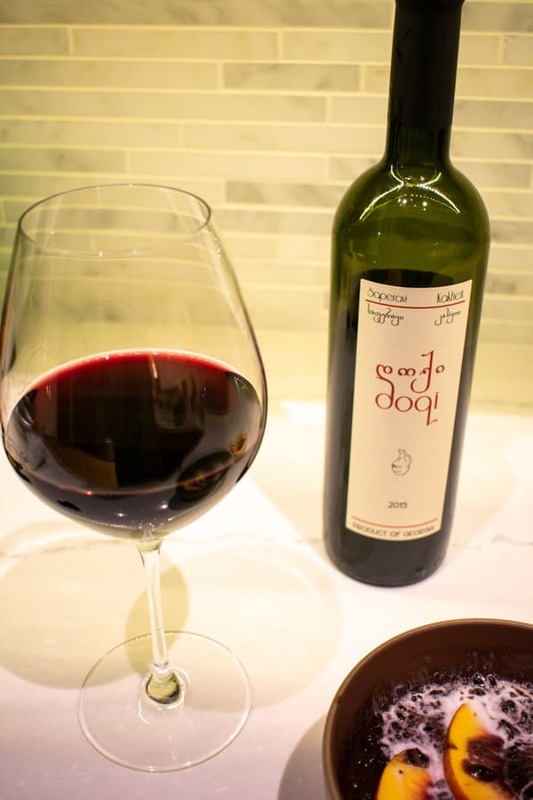 The clay vessel on the label represents a doqi, a clay wine vessel that symbolizes the hospitality of a Georgian meal. 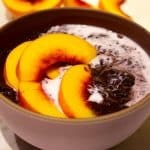 Bring some of that Georgian comfort to your table with this wine and superfood black rice pudding. fruit of choice: mango, peaches, nectarines, blueberries, etc. Once it starts to boil, it will begin to thicken. Keep stirring every 2-3 minutes until the rice is al dente. This should take about 30 minutes. The consistency would be like oatmeal. If it gets too thick, you can add a bit of water to loosen. 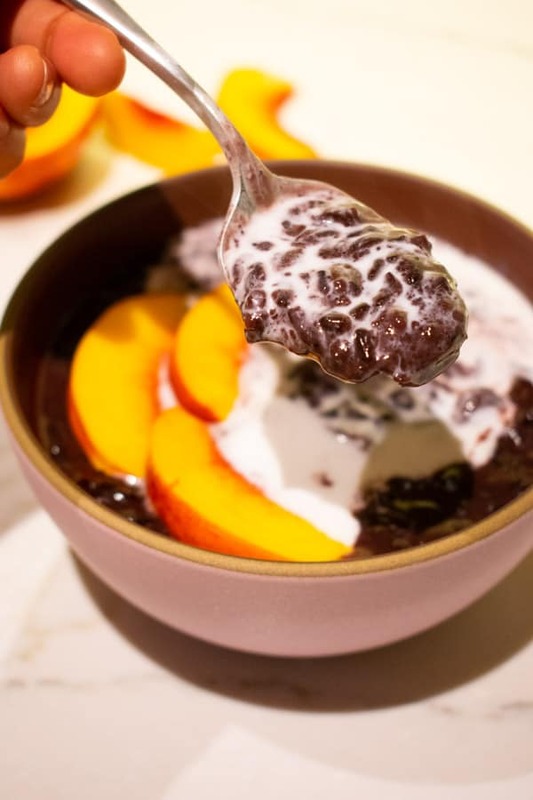 Serve hot with fresh fruit and coconut cream. Leftovers can be poured into serving containers and served cold the next day. 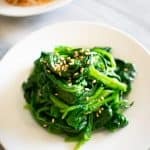 Do you eat superfoods? Please spread the Asian ♥ and share!